HDMI Certified as Stamped on Connector. Connect your portable DVs, Cameras, Game Consoles to your HDTV with a true HD connection! 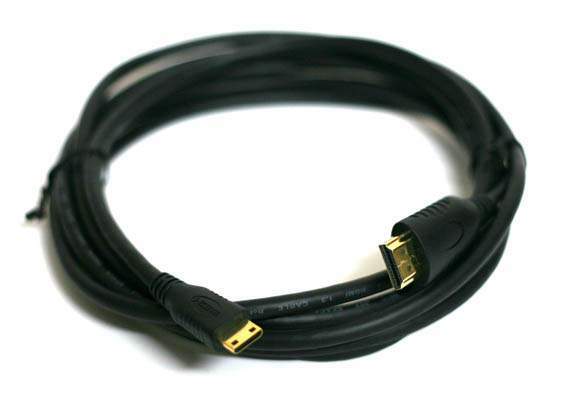 A premium quality HDMI- HDMI mini cable suitable for use with camcorders. Strain relief and Mylar foil shielding. Cable constructed using the high quality material for best contact connection between HDMI equipments.Fully HDCP compliant to provide highest level of signal quality.Fully compatible with High Speed HDMI specification (Version 1.3b). A superb cable with excellent audio-visual transfer properties that deliver signal without compromising purity and balance. Connectors for highest signal transfer rate and resistance in corrosion. Large gauge PVC jacket provides maximum shielding against wear and tear and extreme temperatures; Reinforced quad-layer braided shielding and Mylar-foil shielding provides utmost protection against RF and EM interference;Molded strain-relief design lessens plug/socket pressure;Designed to meet all HDMI standards;Supports 480i, 480p, 720p, 1080i, 1080p, 1440p resolution. Applications: HDTVs, HD Camcorders DVs, Cameras, Game Consoles. Can be used anywhere requiring a HDMI Type-A to HDMI Type-C Mini Connectors.